is a day you, and your spouse, will likely never forget. 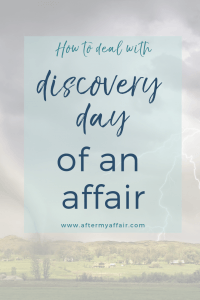 “Discovery Day of an affair is usually defined by the day you or your spouse found out about the others affair. or they are seen together and it’s exposed, or the unfaithful spouse can’t take the hiding and lies any longer and confesses the affair to their spouse (which is my story). 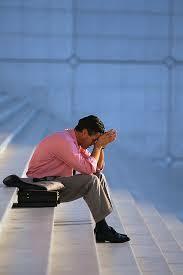 have terrible, guilt ridden emotions after the truth about your infidelity is revealed to your spouse. Even if it was just a one night stand, or you broke it off, your spouse will be devastated at the revelation of your affair. It’s important to note, you might feel relieved by them finally knowing the truth, the lies may have been eating you up for a long time. But your spouses world was just rocked and shaken to the core, and so you are both in very different places emotionally. Try to remember that, and put your self in your spouses shoes, as they’re reeling from finding out the truth of your affair, as you navigate the follow steps. being sure not to ‘tell’ you what they think is best for you and your marriage. It is a deep, cutting betrayal and you likely have so many mixed emotions from sorrow, shock, rage, anger and many others in between. It’s normal. I would suggest not making any rash decisions right now. Your mind is not clear and emotions are raging. Also, try not to run and tell family members and friends who are not safe people to tell. People who will want you to just leave your spouse or get an attitude. It feels good in the short term, but trust me, it’ll complicate your life later if you decide to try to work it out with your spouse. Find a trusted counselor and a safe, neutral friend to confide in. Discovery Day of an affair? Right after Discovery Day of an affair (or D-Day for short), there’s a wide range of emotions both spouses will be feeling. It is hard to navigate what to do first and who to turn to. After 3 weeks in my own affair, my heart was being torn in two and I couldn’t stand the sneaking around and lying any longer. It was March 31, 2007 (I told you you’ll never forget it). The next day was April fools, I didn’t think about it at the time. I just knew I had to tell him. I remember feeling like we were trying to breathe underwater as my life, as I knew it, was turned upside down. The guilt was overwhelming. Which is what caused me to confess to my husband in the first place. With any couple who experiences infidelity in their marriage, there is a process they must go through to get the healing and trust to return. This is the starting point- also called your “ground zero”. Read this post of our personal story, of the day we put a stake in the ground and burned the ships for our marriage. 1. Locate 3 good counselors. Both husband and wife need to find their own individual counselors, and they both need to find a good marriage counselor. It’s very important you interview them and determine what their position on marriage and the direction they want to take you in your marriage. Some counselors don’t believe in reconciliation and will even advocate separating right away. Believe it, we got one of those counselors. So, Just ask them what their plan is for counseling, and what their viewpoint is on divorce. 2. All contact with affair partner needs to completely end. The unfaithful wife needs to COMPLETELY break off any and all contact with the other man. Marriage recovery after an affair is difficult enough, but maintaining contact with the affair partner makes marriage reconciliation impossible. I realize how difficult this is, that is why I wrote about it in “breaking off an affair” here. It is a good idea to read each of the 4 stages of an affair as well so that you can identify where you are in the process. 3. Be the one to fulfill their emotional needs. Begin the process of discovering your spouse’s most important emotional needs. When we discover the way our spouses feel loved and cherished, we can work on showing them love that way. 4. Spend more time together. Spending time together right now may be the last thing you both feel like doing. But time together really is important to rebuild your marriage. Clear your schedules, eliminate other outside distractions, and commit to spending at least 15-20 hours a week with each other. This time should be just the two of you together with no children, friends or any other distractions. It’s truly the only way to reconnect and begin to fill each other’s love tank. (We heard this advice when we were trying to heal our marriage and followed it diligently. 5. Commit to the marriage. I realize this is obvious, but it needs to be said. Be willing to be consistent in your commitment to each other even though it will be hard. Keep your expectations realistic that your healing your marriage will take time. The rewards are waiting for you both when you push through though. There will be steps forward, and steps back again. There will be days it’ll seem like you’ll never get better. Moments when you’ll wonder if trust will be elusive forever. Just hang in there and don’t give up on each other or your marriage. When you can’t seem to break it off. Or maybe you’ve tried before and you just keep getting sucked back into it and are starting to think you’ll never be able to let him go. to break off the affair for good as all my efforts before that seemed to inevitably fail. than if I had turned from my sin and rebellious behavior at Discovery Day. 5 reasons why ending an affair is so hard to do. Your choices after ‘discovery day’ will affect the outcome of your life. Yes, that may sound dramatic, but it’s true. Your husband will be mad, hurt and probably depressed after discovery day. He might even say he wants a divorce right after finding out about your affair. But the statistics show more couples stay together and try to work on the marriage. If your marriage has any chance of surviving your affair, your choices now will likely affect it’s outcome. If you continue in the affair after your husband has found out, the marriage will have less opportunity of recovering. But if you do the hard work now, and break it off with your affair partner, you have a chance of a new start. In all honesty, you’ll have pain either way, whatever choice you make. But the question is, who do you REALLY want to spend the rest of your life with? Try to separate the excitement and emotions of your affair, and ask yourself if he is really someone you would be happy with him in real life, when your marriage ends? What do you want your life to be in 1 year? How about 5 years? Do you truly see a long term relationship working out, with your affair partner? You would be the exception, as only 2-5% of relationships last if they started out as affair partners, (and that’s being generous). So, you have some decisions to make, that will affect you, and your kids if you have them, for the rest of all your lives. Don’t take it lightly. Your emotions are screaming at you to do one thing…but is that really where you want your life to go? Sometimes we don’t take seriously the consequences of our decisions until it’s too late. benefits of your affair, if it’s worth it still or not. will your affair partner make a good spouse if you decide to divorce and pursue a relationship with them. how to break off an affair for good. how to begin the steps of your marriage recovering from your affair if you decide you want to make it work. Feel free to comment on your experience. What helped and what hurt or perhaps you’re right in the thick of it now.